Heard of those customer contact center of large enterprises such as Banks, Maxis, Astro, Celcom and etc where you are greeted by an automated message and being asked to enter 1 for English, 2 Bahasa and so on when you call their hotline? How can OFFSITE IVR TELEPHONY service benefits your business? By capitalizing the Flexi e-Solutions Offsite IVR Telephony service, your business can always project a dependable & large corporate image as your caller will be greeted and guided through a professional voice menu. Together with our intelligent call routing system, your caller can always reach the best person at all time. The reduce wait time improves customer satisfaction and confidence in your company thus increase your business profitability. When a caller calls, he / she will listen to the company's greeting and the 3 options made available for them. Option 1: Call forwarded to sales person. Option 2: Caller will hear the recording of your latest promotion. Option 3: Call will be forwarded to our team of receptionist. Caller's name, contact number and message will be taken and notified to you. Summary: By leveraging FES offsite IVR Telephony system, any business can now project an image of a Fortune 500 company! There are endless possibilities to using our Hosted IVR telephony as it has the flexibility to fit your business needs. Eliminate the need for high initial hardware investments. Offsite IVR system is extremely scalable and can be managed remotely anywhere around the world. IVR system directs caller to the correct department / person. This helps you to handle your client efficiently, reduce time and increase customer satisfaction. IVR system allows caller to retrieve or access information quickly with or without additional human assistance. Call queuing time to departments within a company can be drastically reduced. 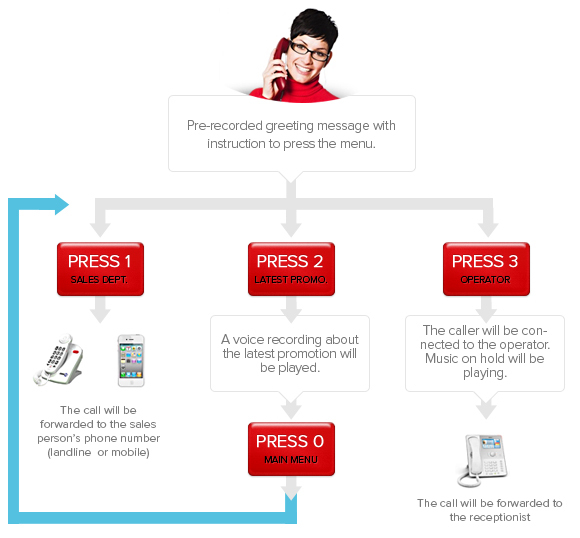 With IVR system, calls can be transferred to appropriate departments through the menu selection process. Provide multi-lingual support by directing the call to the appropriate native language speaker. When call volumes are high, IVR system allows company to highlight new products, updates or product information etc while a caller is on hold. Activation Fee RM150 - One time only! 1 For all international calls, you'll be invoiced on call charges incurred based on Telekom Malaysia standard rates. 2 Any recording should not exceed more than 2 minutes. 3 *For local calls only. Let your company sounds like a large enterprise today!